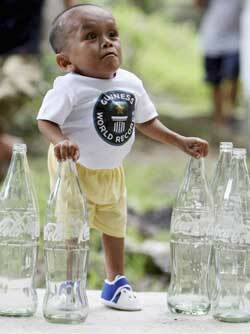 Philippines: A poor Filipino blacksmith's son who stands less than 2 feet (60 centimeters) tall was declared the world's shortest man by Guinness World Records on his 18th birthday on Sunday, sparking a celebration in his far-flung hometown. The title was bestowed on Junrey Balawing in Sindangan in the southern Philippines, with Balawing's parents, villagers and officials showering the coastal town's newly famous resident with a feast, a cake, balloons and cash gifts. Balawing measured 23.5 inches (60 centimeters) during the ceremony attended by about 100 villagers and journalists. Guinness World Records representative Craig Glenday presented Balawing with official recognition of his status as the shortest adult man in the world. Balawing, who wore infant-sized shoes and a white shirt emblazoned with the Guinness seal, took over the title from Khagendra Thapa Magar of Nepal, who is 26.4 inches (67 centimeters) tall, Glenday said. Sindangan, about 450 miles (730 kilometers) south of Manila, has not had so much attention in years - with dozens of journalists descending on this fishing and farming town of 90,000 to cover the event. "Thank you," Balawing told the crowd through his father, Reynaldo, who interpreted his son's words spoken in a local dialect. Balawing blew the candles on a cake and clapped heartily each time the crowd applauded. He was later heard saying "Kapoy," or "I'm tired." Balawing's mother grew teary-eyed during the ceremony. She said earlier that she was happy with her son's instant fame. Glenday said he was struck with the lively personality of Balawing, who constantly smiled and appeared not to be hampered by his condition. Balawing - who is about the size of a toddler and has a child's demeanor - was photographed propping himself up using empty Coca Cola bottles, which were taller than his waistline. "Although he's short, he takes that in stride," Glenday told The Associated Press. "He has this cheeky smile." Aside from a Guinness certificate, the crown does not come with any cash prize. Glenday hoped the international fame would bring in gifts and donations, particularly medical supplies to ensure the health of Balawing, who has to be propped to be able to stand with his weak knees. Nobody could explain why Balawing stopped growing a few months after birth, his father said. Sindangan Vice Mayor Bess Jagonio, who is a doctor, said Balawing "was just the size of 2-pint (1-litre) soft drink bottle" when he was born and speculated he may have suffered from an endocrine or a birth-related defect. Balawing's three other siblings - a brother and two sisters - are all of average size for their ages. Balawing's mother, Concepcion, said she and her husband tried to send him to school but withdrew him after he distracted other children's attention. Local officials got the idea of informing the Guinness records committee about Balawing from journalists, who learned about his condition and the possible fame that awaited him.